Mana Pools in Zimbabwe is famous for it’s walking safaris. It’s one of the few conservation areas in Africa where you’re allowed to walk freely among the wild animals. 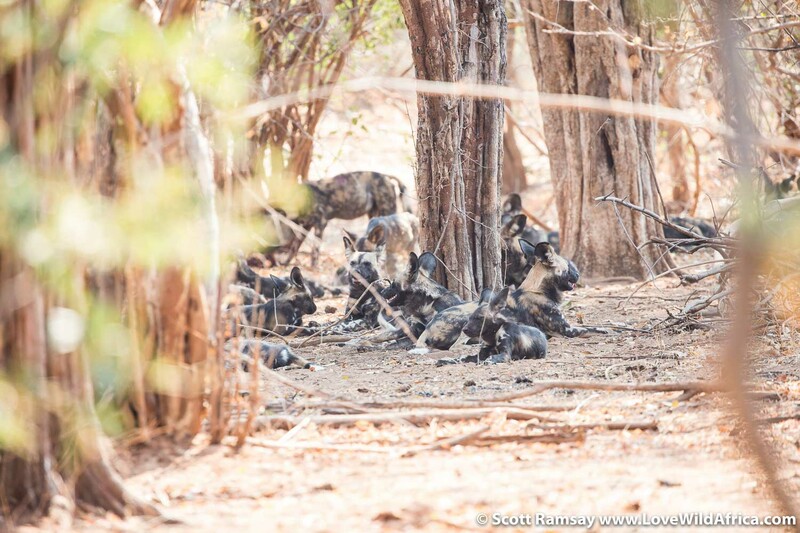 While staying at Little Ruckomechi camp, I was lucky to go walking with wild dogs in Mana Pools. Well, I’m taking some serious poetic license here. Actually, when you’re walking in Mana, and you come across wild dogs, anything can happen, and it’s always out of your control! They are prodigious athletes, able to outrun almost any creature over long distances. And so if you see them, you better be prepared to trek! Honest found their tracks while we were out on our morning drive. We tried to figure out where they were, but the tracks were all over the place. 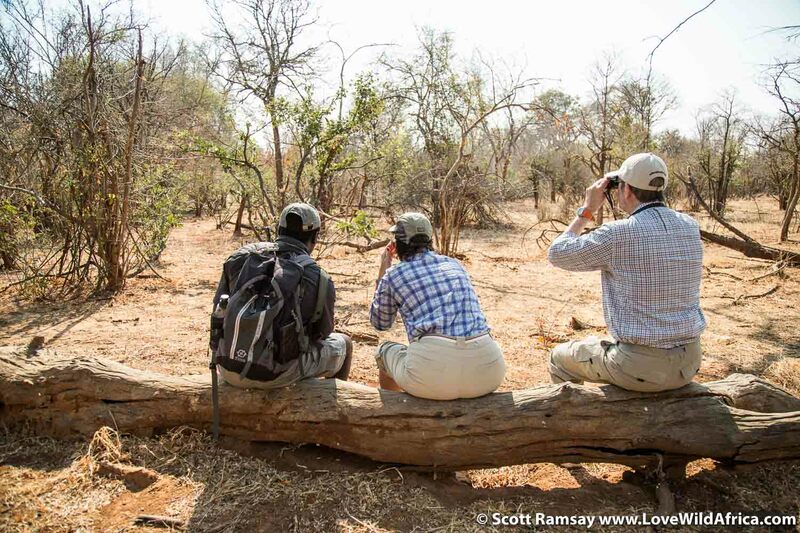 Eventually, we spotted some vultures circuling above the mopane woodland. So we left the vehicle, and walked slowly in the direction of the big birds. 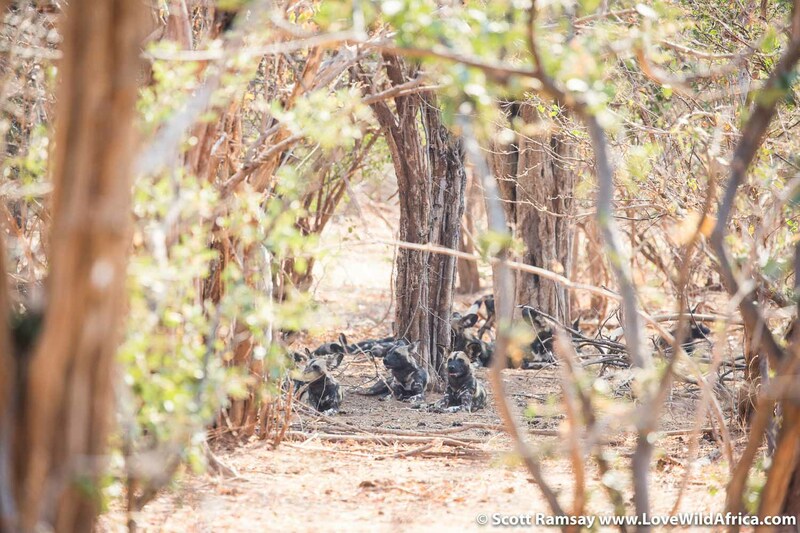 Sure enough, as we came to some thick bush, we could see a pack of wild dogs, resting up in the shade. 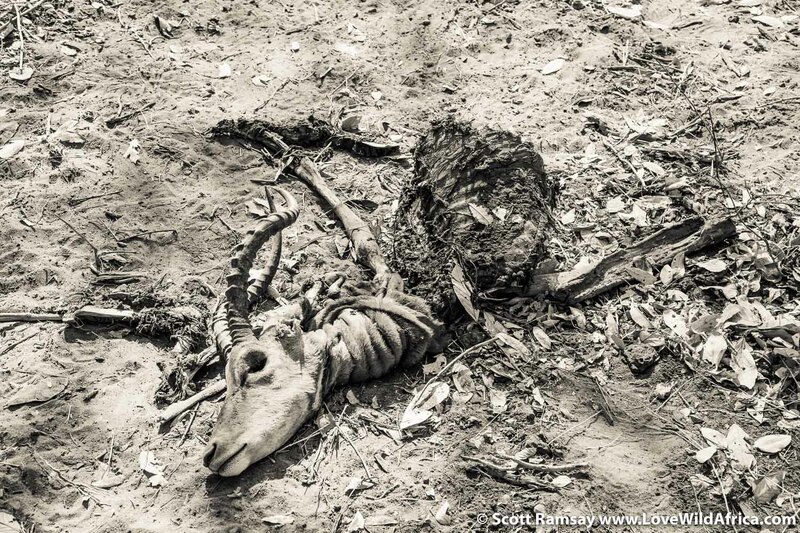 The skeleton of an impala lay nearby, totally stripped of its flesh. We watched for a few minutes from about 40 metres away. 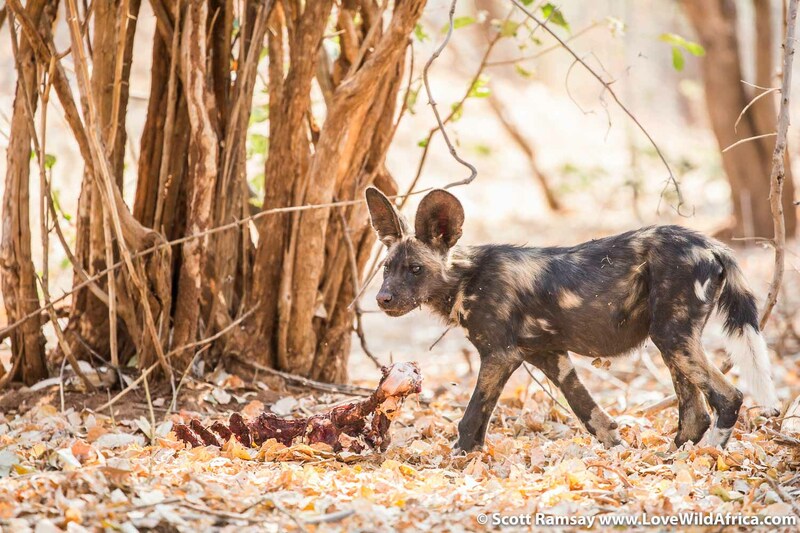 The wild dogs of Mana are remarkably tolerant of humans on foot…but within a few minutes, they were up and running, looking for their next bit of food. We stayed put, not only because there’s no chance of keeping up with the dogs, but because there was a young dog that was fast asleep, and didn’t hear his companions move off! We watched the youngster wake up slowly, circle the area a few times, looking for his mates. Soon he pushed off as well, howling his beautiful call, a lonesome, sonorous whooooop that can be picked up miles away by the large ears of his brethren. 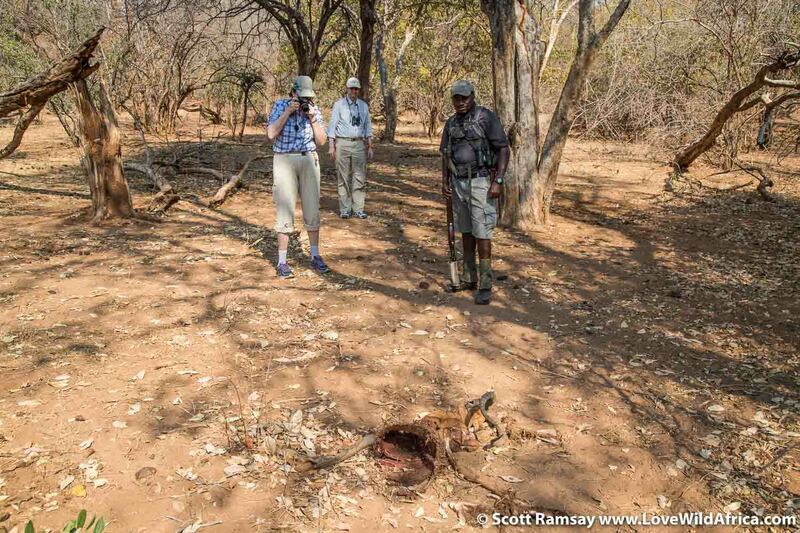 Once he had gone, we walked up to the site of the kill, and had a look at the impala carcass. 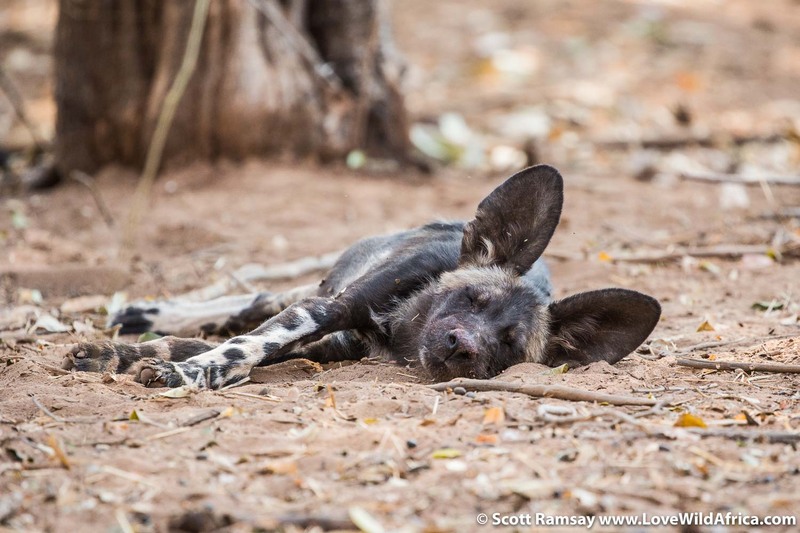 Wild dogs are such efficient predators in every way. 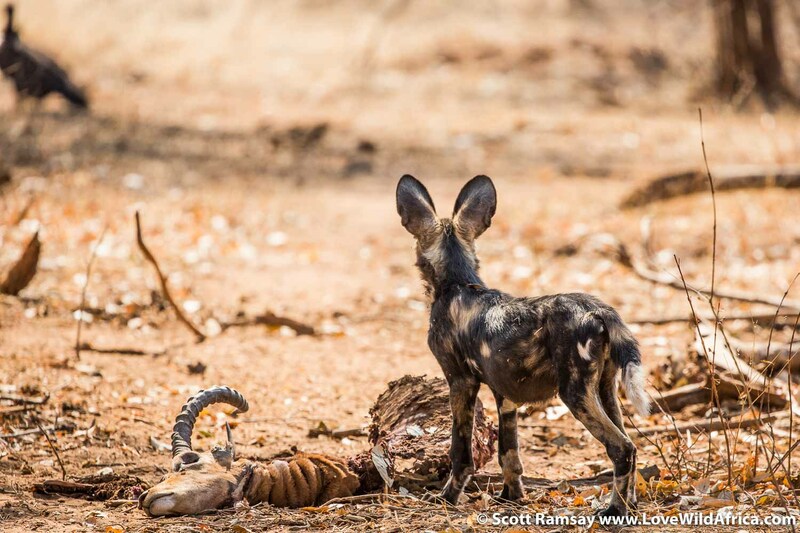 They not only have one of the highest kill success rates of any predator in Africa, but they eat almost everything on the carcass. Even the eyes.